From loneliness to solidarity: the artist Selina Thompson reflects on her experiences at this year's Edinburgh Fringe. Hi! My name is Selina Thompson. I am black, I am a woman, I am 27, I am an artist. I live in the UK. I have a show at the Edinburgh Fringe Festival this year called salt. ItissoldoutIcan’tgetyouin. I love the fringe. This is my 5th time. Each time I have been up here, it has felt like a very different racial context. I wanted to reflect a little, with you, on how I have found it this year. I am sitting in bed, surrounded by flu remedies. I am a cesspool of germs. I am trying to figure out whether to go and see a show or not. The show is called Mixed Brain, and in it, I believe that a young man of colour will be speaking about his experiences as a young man of colour in the UK. I am too sick to go to see this show, having vomited twice this afternoon. But I think of my show this afternoon, my show about my experiences as a black woman in the UK. I think of looking out into a white audience, and feeling horribly, horrifically alone, feeling like doing the show is going into battle. I do not want this to be the case for him. So I double my dosage of Day Nurse. I am determined to go, to sit in the front row, to be present, as other people of colour have been present for me. Home is Not the Place. What If I Told You. Becoming Schezerade. Half Breed. Illuminarchie. Girls. Mixed Brain. Woke. Taha. Pike St. Hot Brown Honey. Bone Woman. Quarter Life Crisis. Yvette. Out. The Believers Are But Brothers. salt. The Last Queen of Scotland. Jihan’s Smile. The Black That I Am. KMT. G.O.D. The Fall. Where is Home. Love, Bombs and Apples. London Hughes Superstar. Nina, a Story about me and Nina Simone. An Evening With An Immigrant. Unfuckable. Adam. Border Tales. The Concrete Jungle Book. The Illusion of Truth. Show Me The Money. Eaten. I try to see them all. A Twitter Message. From a woman who is lighter than me, with different hair, from a different country, with a very different show with a very different title looking at very different things. Another woman with a show in her venue, congratulated her on being in the Guardian list of picks of the Fringe. My friend is confused, because she is not in that list. She is trying to work out if she has been confused with me, the only other black woman on the list at that time, or if she has been confused with another work that is thematically linked – but very, very different. I recognise the gluey, sticky feeling – am I mad, am I paranoid or is this whiteness at work – and do the only thing I can do. I bear witness to it. I am sharing a flat with various people, one of them is a man of colour. There is one day when I come home, and the two of us rant for a bit. About being ignored in restaurants. About people making a point of not flyering us. He says “As I was walking down the street today I was thinking, do I need to shave, do I need a haircut? And then I thought no, no I’m not doing this.’” I am glad we are able to bear witness to each other. I imagine him walking past what often feels like an endless sea of white faces. We do not all have the same experience being flyered for shows. A young artist and I are facetiming. It is the first time we have ever spoken. Her experiences spill out of the screen, lots of unearned intimacy, because we are two black women in a very white environment. The one thing that stays in my mind is her saying ‘I left my flyers in a bar – and the man in the pub said – “no offence, but I think you should just go back to your country”’ At this point she looks around the bar, realises how white it is, and leaves, leaving her flyers. I am livid. Livid. I am livid with her producers for putting her in that position. I am not flyering salt personally, very strategically, as an act of self-care, for the same reason I am not reading the comments beneath any reviews. This is, I know, a privileged position to be in. We do not all have the same experience, flyering our shows. I think of myself, three years ago. Very naïve. Hurting. Not seeing any work by Artists of Colour. Not thinking to connect to any Artists of Colour. Of Ferguson spilling out of my phone, as Charlottesville spills out of it now. I think there are a lot of artists of colour now, compared to years before. Many other artists of colour that I speak to do not think this. I am inclined to think that they are right. It is important to resist the idea of the tipping point, the idea that diversity has been done and now we can stop working. In 3,500 shows, less than 100 shows from artists of colour is not good enough. I have listed above the ones I could find with a quick search. There will have been more, and there is, of course, a series of strands of international work. But we stand out. And it is a gluey, sticky feeling. It is crushingly lonely. One of my worst experiences of the whole festival is an interview with a big paper. The man that interviews me asks no questions about my work. He wants to speak about ‘the exotic’ at the festival. He wants to talk about Exhibit B. He wants to talk about how to fix diversity. He hasn’t heard of any of the other shows of artists of colour that I reference. He complains that when he has seen shows by Artists of Colour they have been one sided, that his side has not been heard. He suggests that me being the only person of colour in the room in a theatre in Edinburgh is a bit like him being the only person with blonde hair and blue eyes in a theatre in Turkey. A few days later, a white woman at a panel talk tells me that people are people and we all know what it is to be isolated so race doesn’t matter. Both of these people apologise after they have seen my show. That, I suppose, is something. One of my best experiences of the whole festival is an interview with Fest Mag. They leave me and Desiree Burch with a Dictaphone. That’s it. The time that is made for this interview with another woman of colour feels rich and exciting, makes my brain fire up with new angles and thoughts and perspectives. A friend tells me that one of her best experiences of the festival is having Hot Brown Honey appear, en masse, in their yellow gold tracksuits to see her work. She recognises that this is an act of solidarity, that HBH embody the politics of their show as they move around the space of the festival. They remind me, always, of the power of the collective, of what can be achieved when we work together. I fantasize sometimes, as I walk around Edinburgh about what it would be like to have an equivalent of the Venice Biennale’s Diaspora Pavilion. A collective of artists of colour, with their own space, showing work and splitting the risk, with writers and talks contextualising their work, with spaces that were as connected to the international work that sits within the festival as it is to the work that is being made by Artists of Colour in Edinburgh all year round – artists like Mara Menzies, Apphia Campbell and Annie George. What it would be like to have salt., my show, rigorously discussed by people who had the expertise, via life experience and/or academic research to discuss its themes and form. Of problems that might also be raised by this – of whether separate is ever truly equal. I think of the work, thought and money this would take, and sigh quietly to myself. In many ways it could be argued that Shaina Simmons’ Artist of Colour Fringe Meet Up is the first unfurling of such a utopic idea. On an early Saturday evening, around 50 artists head to Fringe Central to munch on crisps, drink coldish wine and connect. The space buzzes with all of the energy of the slightly safer space and it illuminates all who are gathered from within. But I’m aware of a cataloguing of violences – being called a Blackie while someone tries to tip you off your bike, being called a Gollywog down the shops, negotiating Hitler signs in bars. Black American artists wondering what their experience of home will be. A reminder of the additional violence that our trans siblings are encountering as they negotiate the festival, the knowledge that any movement for artists of colour at the fringe also needs to think about exploitation, and the artist as worker. 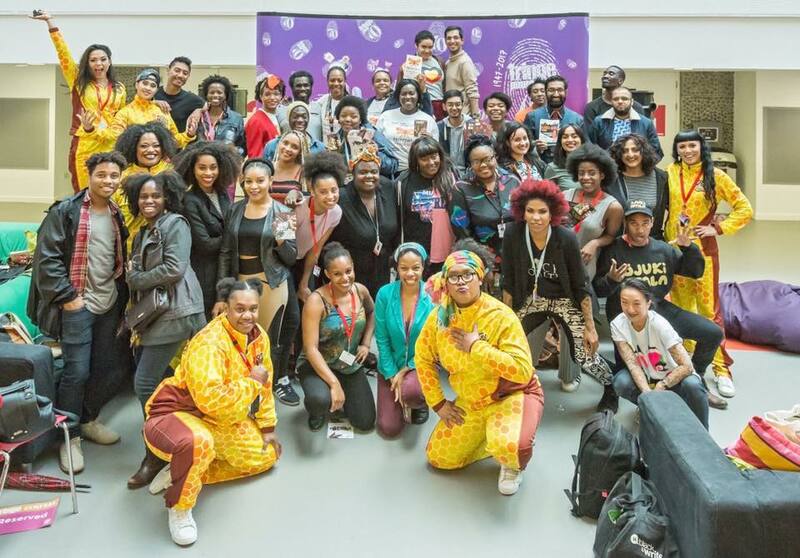 A space for People of Colour is often a charged one, because within this group there are privileges and clashing perspectives that are slightly harder to articulate and deal with. I leave the evening feeling pensive. A couple of days later a friend and I go for breakfast. We discuss her show. There is a shining moment, in the sun, where my friend states, fiercely, her right to take up space at the festival – her right, and my right, and the right of other artists of colour there to take up space unapologetically, states that there are more of us than usual, but there are still not enough, talks about our need to connect, to find each other, and build. I love her in that moment. Every day I text Dawn Walton, my director, and the Artistic Director of Eclipse my show report. Her emotional support and care is one of my bedrocks of the festival, she anchors me. She came to see my first show, Chewing the Fat, here, and it was the beginning of a friendship and collaboration that has enriched my practice and my life. Dawn changed my approach to being one of the only Black and/or Brown faces in white spaces. Watching her, carefully, I began to emulate her approach – which is, amongst other things, to make an automatic beeline for the other person of colour in the room. To acknowledge that the two or three or four or five of us are standing out, and to cut across that isolation with connection. I try really hard to follow her example, despite a lethal combination of anxiety and grumpiness. To reach across the feeling that tells me that a) I don’t belong here and that b) I am in competition with the other people of colour here, that there can be only one. To reach out, beyond networking, and connect. I am proud to have been part of a year of artists of colour making extraordinary work, warrior work, loving work, clever, funny, beautifully crafted work. The Artist of Colour meet up ends with Nilaja Sun telling us about an epiphany she had as she performed her show Pike Street earlier that day. A reminder that to be an Artist of Colour is to be a manifestation of our ancestors dreams, is to be your full self, stretching out and taking up space. May we keep doing it. May we be supported properly as we do so. And may we support each other too.